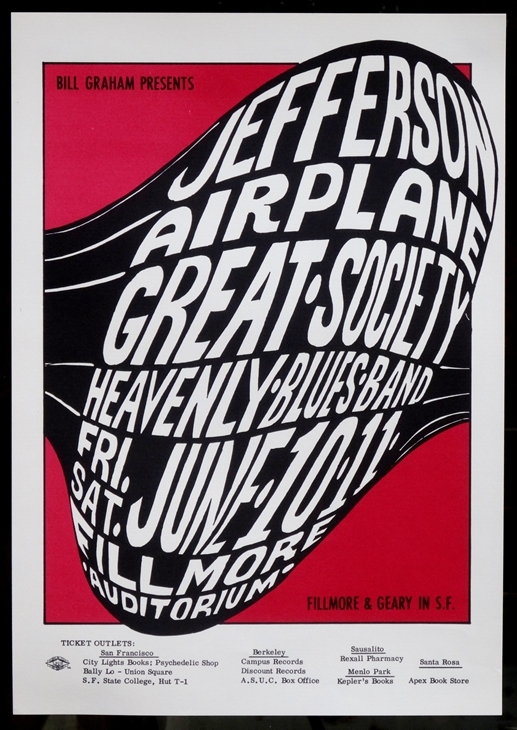 Official promoter-issued 1966/67 2nd printing 14 x 20" concert poster for the Jefferson Airplane appearing with the Great Society and the Heavenly Blues Band�at the Fillmore Auditorium in San Francisco, CA from 6/10-11/1966. Art by Wes Wilson, image is # 10 in the Bill Graham/Fillmore series. Thick flat stock poster is in excellent (A-) condition; only a very minor amount of corner wear, otherwise very sharp.